This article discusses the concepts and terminology of AC electricity at an introductory level. The scope of the article is limited to the AC power systems found in North and Central America. In Part 1 (this part; already plenty long enough), I will discuss the basics of AC power generation and the delivery of AC power to single-family residential neighborhoods and homes. In Part 2 I will continue with a more focused discussion of the AC power systems on cruising boats. I chose this approach for two reasons. First, almost all homeowners have some familiarity with household AC electricity. At the very least, most homeowners can find the circuit breaker panel and reset tripped breakers. Second, and more important, boat AC electrical systems are just a subset of what is found in a single-family residential AC installation. Boat AC systems are equivalent to sub-panels in a residence. Sub-panels are subordinate to the main service disconnect panel in a residential building, and in the same way, boats are subordinate to the AC electrical infrastructure of a marina. A basic understanding of household AC electrical systems puts boaters 75% of the way towards understanding boat AC electrical systems. Where boats differ from land-based residential buildings, the reasons are based on specific safety issues that emerge in, and are unique to, the marine environment. Boat AC electrical systems are significantly more complex than single family residences. This article will assist readers in having confidence to talk about electrical topics with a professional, marine-certified, electrical technician, either designer or tradesman. There is one absolute, always rule whenever you must deal with electricity. VIRTUALLY ALL ELECTRICIY CAN BE DANGEROUS TO PROPERTY AND LIFE. Even de-energized electrical circuits can retain enough stored energy to create a life-threatening hazard. The large batteries found on boats can produce explosive gasses and store enough energy to easily start a large, damaging fire. ALWAYS WEAR SAFETY GLASSES while working around electricity! If you will be working in noisy environments, with running engines or other loud machinery, WEAR HEARING PROTECTION. Well, then, LEAVE IT ALONE until you learn more! Electrocution is a biological insult that starts with an electric shock that paralyzes either the respiratory or cardiac functions of the body, or both. Electrocution results in death. Even very small electric currents, under the right circumstances, can result in electrocution. Obviously, electric shock can be a life threatening emergency. STAY CALM! You can not save someone else if you panic! Avoid becoming a victim yourself! DO NOT TOUCH THE VICTIM, METAL MACHINERY OR NEARBY METAL OBJECTS IF POWER IS STILL PRESENT! REMOVE THE POWER SOURCE FROM THE VICTIM BY DISCONNECTING THE ELECTRIC POWER at the pedestal. If the victim is in the water, KILL POWER TO THE ENTIRE DOCK. THROW LIFE RING TO VICTIM. DO NOT ENTER THE WATER YOURSELF! After power is removed, raise the face of an unconscious victim out of the water. After power is removed and the victim’s airway is secured above water, if help has not arrived, call 911 again! Two 911 calls are better than none. After power is removed, and with access to the victim, assess victim and initiate CPR as appropriate. CPR is often successful in reviving or saving electrocution victims who are otherwise healthy at the time of the accident. CONTINUE CPR UNTIL THE VICTIM REVIVES, UNTIL EMS ARRIVES TO RELIEVE YOU, OR UNTIL YOU ARE PHYSICALLY UNABLE TO CONTINUE! Like gravity, electricity is invisible. A common analogy used to explain electrical concepts is to liken an electric system to a community water system. Consider the familiar garden hose fit with a nozzle. In the garden hose, when the nozzle is opened, “pressure” in the system makes water flow. Assume we have a 3” diameter water hose and a 1/2” diameter water hose, both attached to the same water source. Only so many molecules of water can fit through the small hose in a minute, but many more molecules of water can fit through the large hose. This concept is called “carrying capacity.” Only so many electrons can “fit” through a wire per unit time. The larger the wire, the more electrons. Electrical “carrying capacity” is called “ampacity.” “Ampacity” is a rating assigned to wires. Wires of the same metal, of different sizes and covered by insulation with different thermal and chemical properties, have different rated “ampacities.” The ampacity rating is the safe maximum current the wire can carry within the temperature rating of the wire’s insulation. Ampacity tables are widely available on the Internet. The electrical potential of the earth is defined to be “zero” volts. It is the standard reference point for shock and electrocution safety. In order to connect a residential electrical system to “earth ground,” one or more interconnected rods of copper are driven into the ground. The neutral return point of the residence’s electrical system is physically connected to the network of copper grounding rods. The concept of “earth ground” is absolutely essential for the safety of people, pets, farm animals and wildlife. The entire electric distribution grid of the country is connected at innumerable points to rods driven into the earth (the “electric grid” is a “multi-earthed system”). Every residential property has an “earthing” connection at the service entrance to the home. The essential point here is that “earth ground” is a universally understood reference point for all power distribution systems. It represents the presence of “zero” electrical potential, or stated in the negative, the total absence of any voltage. We will return to this concept over and over as we proceed in our discussion. Direct contact with energized high voltage is completely safe as long as you are not “across” two or more electrical conductors. For current to flow, there must be a connection between two conductors where there is a voltage difference between them (that is, “across a voltage”). Consider, birds sitting on high tension transmission lines, or squirrels running along neighborhood overhead wires. They are safe because they are on, but not across, a voltage. The animal’s entire little body is raised to the voltage of the wire upon which they sit, yet they are perfectly safe because there is no path for current to flow THROUGH the body. The electrical activity of their brains and hearts is not affected. But, a human being on a wet concrete floor wearing leather shoes best not come into contact with a “hot” wire. That concrete floor is made with salt-containing minerals, and most definitely is electrically conductive, especially when wet. A person standing on that floor and simultaneously touching an energized wire is “across” an electric voltage. That is a shocking experience! Maybe, a fatal, shocking experience. It is a fact of physics that electrons carry a negative electrical charge, which means electrons flow from a more negative voltage in a circuit to a more positive voltage. However, by universal agreement, or “by convention,” the entire practice of electricity and electronics treats current as flowing from positive to negative. The direction of electron flow has no practical importance, but to properly interpret electrical diagrams, you need to understand the conventional way current flow gets represented by arrow-containing symbols. The symbols on electrical drawings are all agreed by “convention,” or “working agreement.” Industry-specific symbols are agreed by international standards organizations. Where there are symbol differences, their meaning is often obvious. Some differences occur across international boundaries. The power industry uses different symbols than are used in the electronics industry. The “single phase, center tapped, three wire” service is the residential standard in use, by convention, all across North and Central America. It is institutionalized in the National Electric Code of the US and The Canadian Electric Code in Canada. Completely different systems are used in other parts of the world, including Europe, Asia, Oceania and southern South America. The insulation used to coat electrical conductors is colored. The colors, by convention, identify the use to which wires are put. 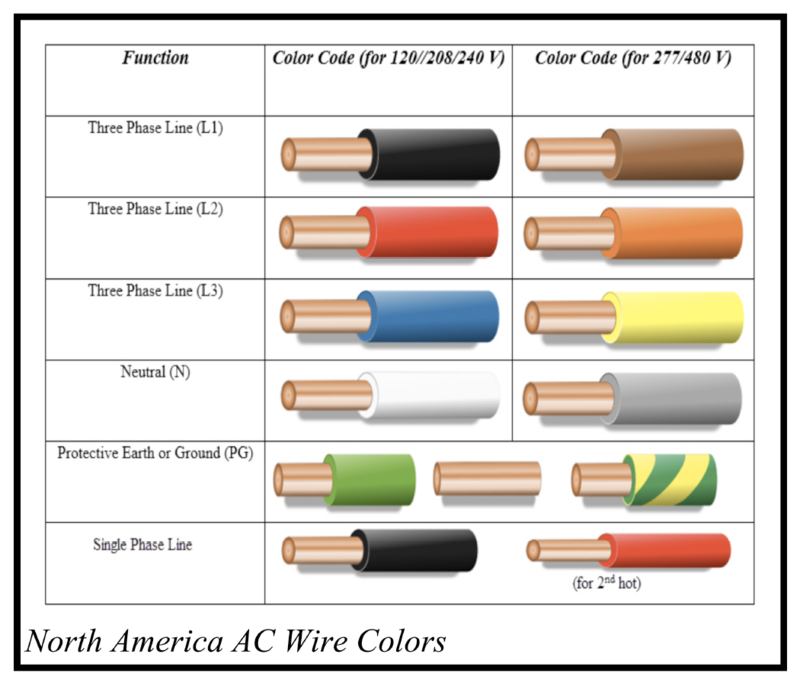 Understanding the color schema for wires is essential to electrical safety. Mistakes here can be fatal. The meaning of colors vary from country to country. There are numerous differences between the United States and the nations of the European Economic Community and Oceania. For those interested, tables are available on the Internet that document color meanings. The laboratory study of “electrical energy” is a theoretical and conceptual science. I view craftsmanship in two stages, which can be sequential or iterative. If you have ever done an electrical project, you’ve performed both of these functions. The first stage is the domain of the “circuit designer;” i.e., the person who designs a branch circuit for installing a ceiling fan with a single switch to turn the fan “on” and “off.” Or a slightly more complex branch circuit with three switches to turn a light “on” and “off” from different locations. Or a much more complex array of multiple branch circuits to power a “man cave” or “she shed.” Or the system for an entire home. The designer must have solid knowledge of the National Electrical Code (NEC). Electrical designers for boating applications must be thoroughly familiar with the American Boat and Yacht Council (ABYC) electrical standards. The NEC and ABYC standards have as their purpose avoiding or minimizing present and future loss of life or damages to property. The work product of the designer is a system drawing that defines the purpose of a circuit and the manner in which that purpose will be achieved through the use of electrical equipment, components and materials. The work product includes a the bill-of-materials of the components required to implement the project. For most projects, a reliable cost estimate can be produced at this stage. The second craftsmanship stage is the domain of the skilled technician who is charged with the doing of the thing. This craftsman must know how to use and interpret the designer’s drawings and how to use an enormous array of electrical meters and mechanical tools in the safe fabrication, construction, installation and maintenance of electrical circuits. This craftsman must understand current assembly techniques, materials and supplies, and must understand and deeply respect industry safety practices. Safety practice involves knowing when to and when not to work around, and with, energized electrical circuits. On boats, because of the special safety implications of an electrical system on a floating structure, this craftsman must understand not only what to do and how to do it, but in fact, why things are done as they are, in making an electrical installation safe. 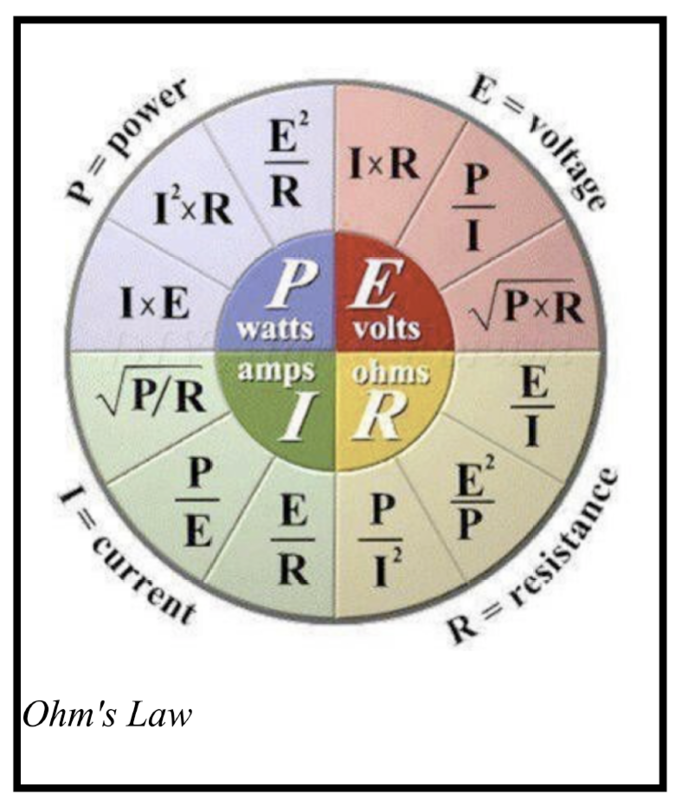 Ohm’s law – describes the mathematical relationship between voltage, current, resistance and power. voltage – (Volt) the quantification of “Electromotive Force” (EMF) (“propulsive energy”) that acts on a circuit to force electrons to flow. Electromotive Force is measured across two points in a circuit. current – (ampere; amp) a quantification of the number of electrons flowing through a circuit at any one time. resistance – (Ohm) a characteristic of an electrically conductive material that tends to retard or impede the flow of electrons through it. power – (elect: Watt; Joule) (mechanical: inch-pounds, foot-pounds) elect: the amount of “work” that electricity performs in its application. In purely resistive applications, light or heat. In turning a motor, torque. frequency – (Hertz) the number of times a wave goes through a complete cycle in a standard measurement time interval, usually one second. source – the origin from which AC power emerges to energize a circuit. load – the components of an electric circuit where energy is consumed to do useful work; “useful work” includes production of heat, light, or torque via a motor. common – a portion of a circuit connection or set of connections that creates a direct return path for electrons flowing in an electric circuit. neutral – a special case in an AC circuit of a non-ground return path for electrons flowing in a North American standard residential electrical service. 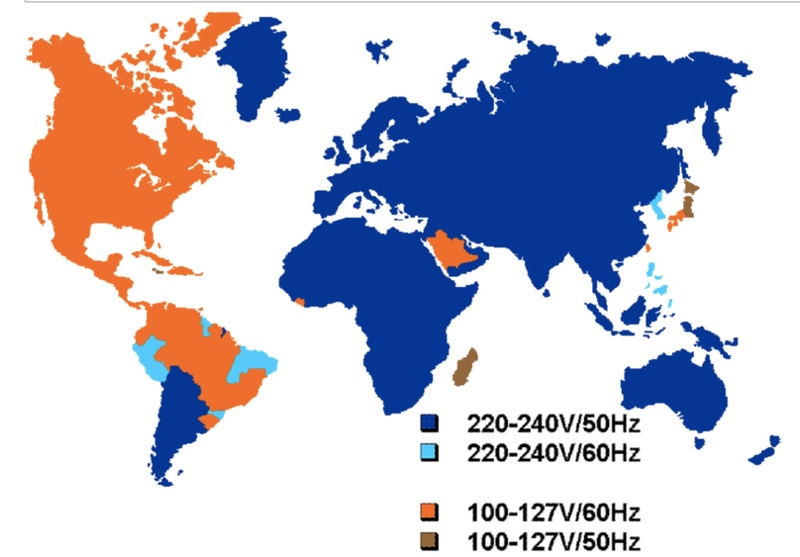 ground – a universal standard earth reference voltage of “0” volts. fault current – an abnormal path for current flow, usually to ground. Fault currents represent potentially dangerous conditions. short circuit – a specific category of electrical fault resulting from an unintentional direct connection of an energized conductor to either a return circuit or an earth ground. This low-resistance, unintentional connection results in the flow of extremely large fault currents, and causes overload protection devices (fuses, circuit breakers) to open in order to disconnect the energized power source. GFCI (Ground Fault Circuit Interrupter) – an anti-shock safety device that senses leakage currents and disconnects the energized power source. AFCI (Arc Fault Circuit Interrupter) – a fire protection safety device that senses lose connections and disconnects the energized power source. GFP/EPD/ELCI (Ground Fault Protection/Equipment Protective Device/Equipment Leakage Circuit Interrupter) – similar to GFCI, but higher disconnect specifications. chase, raceway, conduit, “emt” – enclosed containment spaces in a building or a boat through which wires are run to achieve access to distant locations or to protect wiring from accidental physical damage. 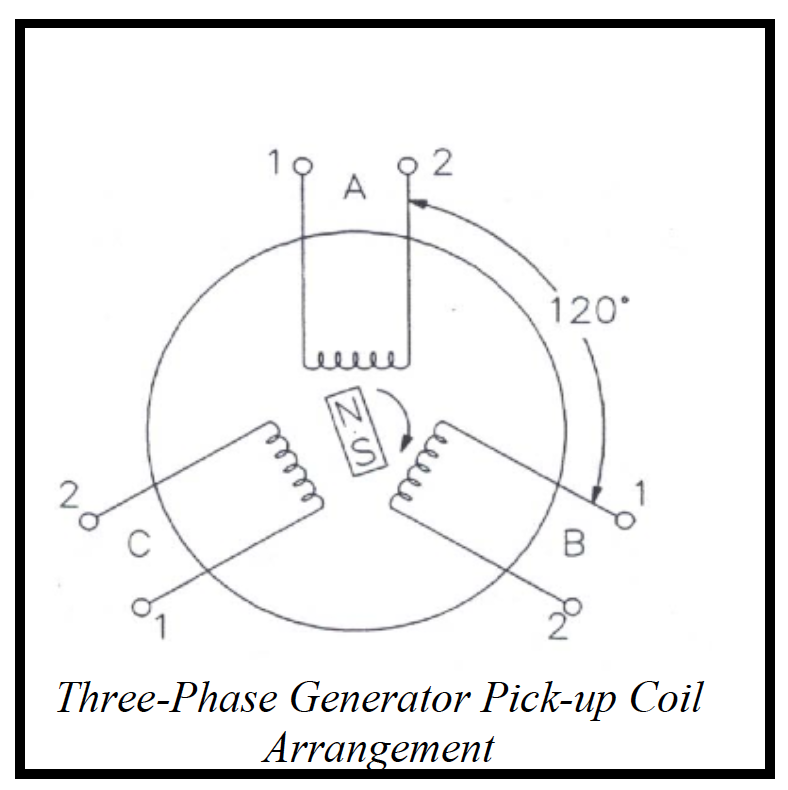 Field Coil – the rotating part of one design of AC generator; this coil can be a DC permanent magnet (typical in small machines), or a DC electromagnet. Voltage Regulator – the device that determines the strength of the magnetic field in an AC genset by adjusting DC current flowing in the spinning field coil. Stator – the fixed coils of one design of AC generator, from which sine waves of AC power emerge. Armature – the power-producing component of a generator; the rotating part of a DC generator; the fixed coils (Stator) in one design of AC generator. switchgear – a generic term for all disconnecting devices (fuses, circuit breakers, switches, power panels). This term is used across the electrical power industry, from generating station to transformer yards to residential locations. Inductance (Ohm)/capacitance (Farad)/Power Factor (unitless) – technical characteristics common to the behavior of AC electricity in circuits that significantly affect large motor driven appliances and all electronic devices. These become increasingly important as voltages, frequencies and power consumption rise. Managing the collapse of a magnetic field – a design consideration of any magnetically operated electrical devices (motor, generator, relay, etc), and many solid state devices. A significant safety consideration for maintenance craftsmen. When a magnetic field collapses, it creates a very high energy spike, which sometimes includes an electric arc. ABYC – American Boat and Yacht Council, Annapolis, MD. This organization produces a very comprehensive set of electrical standards applicable to boat manufacturers, the marine insurance industry and boat owners. NFPA – National Fire Protection Association; owner/creator of the NEC. NEC/CEC – National Electric Code (USA), Canada Electric Code (Canada). electrical design standards for political subdivisions and the construction industry. Ranges from codes for residential housing, light commercial and industrial buildings, elevators, hospitals, airports, and heavy industry. There are three primary divisions of all electrical power distribution systems, including the global system we call the “nationwide electrical power grid.” They are 1) the source of the electrical power, 2) the transmission system, or interconnecting wires and switches that carry power from the source to the point where it is consumed, and 3) the load, or the part of the system where the electrical energy is transformed into useful work. At the level of the US national electric power grid, the source of AC electric power is one or more generating machines located in one or more generating stations. Often, the term “alternator” is used interchangeably with the term “generator.” These generating stations range in size from enormous, industrial-sized installations to small rural hydroelectric dams to units suitable for individual residential applications. The substations, switchgear and wiring that connects sources of power to load centers are extremely complex, involving may hundreds of miles of high tension power lines, enormous transformers and highly complex switches. Transmission equipment can also be as simple as an extension cord run from the garage to the hedge clipper. Electrical loads fall into the entire range of electrical equipment, from the largest commercial synchronous motors to the smallest and most humble LED electric clock. 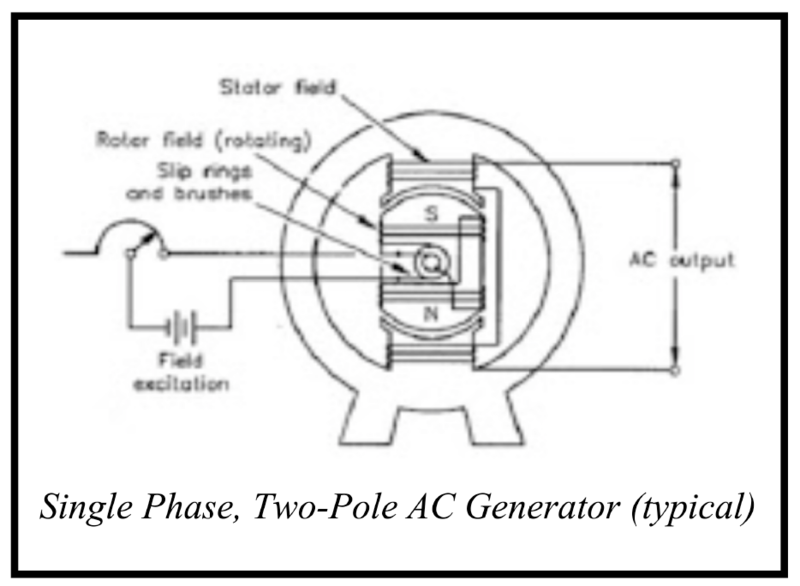 Typical AC electric generators have a rotating magnet (imagine the big bar magnet you played with in grade school science) which has a north pole and a south pole. That magnet may be driven by a belt, wind or water turbine or direct drive, but ultimately, it’s a spinning magnet mounted on a shaft. The north and south poles of the spinning magnet travel in a circular path. A pick-up coil is positioned just outside the edge of the circle. As the magnet spins on it’s shaft, the poles of the magnet approach the fixed pick-up coil, producing an electric voltage at the pick-up coil. As the spinning magnetic pole gets physically nearer to the pick-up coil, the voltage at the pick-up coil gets progressively larger. Once the magnetic pole moves past and away from the pick-up coil, the voltage at the pick-up coil gets progressively smaller again. When the north and south poles of the magnet are both equally distant from the conductors of the pick-up coil, no voltage is produced at the pick-up coil. The voltage induced in the pick-up coil by the passage of the north magnetic pole is equal in magnitude and opposite in polarity from the voltage induced by the passage of the south magnetic pole. One pair of north and south magnetic poles that sequentially rotate past the pick-up coil produce one cycle of AC voltage at the pick-up coil on each revolution. The speed, in revolutions per minute (RPM), of the spinning magnet determines the frequency (Hz) of the generated voltage. The resulting AC wave form is called a “sine wave,” which is centered around “0” volts. Sine waves rise and fall in smooth, graceful fashion with no sharp transitions in the shape of the wave. In the preceding diagram, there is a geometrically balanced arrangement of a spinning magnet and a geometrically balanced arrangement of pick-up coils. The output power of the generator is directly proportional to the strength of the magnetic field, up to the limits of its materials and mechanical design. The output consists of two wires, and is referred to as “Single Phase” AC. Many physical arrangements of the magnet poles and pick-up coils are possible, but the basic principle is the same for all AC generators. To produce 60Hz AC, a single phase, two-pole, gasoline-driven, big box store genset (2500W to 6kW) typically spins at 3600 rpm; a single phase four-pole Marine genset (7.5kW to 25kW) typically spins at 1800 rpm. Because of the enormous weight and mechanical forces involved, multi-megawatt commercial generators may have 24 poles and spin at 200 rpm. The rotating magnet in an AC generator is called the “field coil.” The field coil is just a spinning DC electromagnet. DC is fed to the field coil via slip rings and brushes on the spinning shaft. The fixed pick-up coil in an AC generator is called the “stator coil.” It is wrapped around iron support columns that are fixed in position around the perimeter of the frame of the machine. Occasionally, the term “armature” may be heard; an “armature” is defined as the power-producing component of a generator. In a DC machine, it is the armature that spins, with field coils stationary in the frame of the machine. Fixed field coils with a spinning armature is a construction alternative for small frame AC alternators (<25kW). This is both more costly to build and much more complex mechanically, so not common in the generator sizes found in the consumer retail market. The amount of power that a generator can produce depends on many aspects of the physical construction of the machine, the amount of energy available from the driving motive source, the size of the internal conductors and underlying metal components, the strength of the internal magnetic field, and many other factors. In reading through questions and discussions on various Internet boating bulletin boards , the differences between “single phase” AC and “three-phase” AC is often a point of confusion. Three-phase power is extremely rare in residential settings, and few people have any life experience with it. Consider the above preceding description of generator concepts. Commercial power plants are fit with enormously large and heavy generators. For several reasons, it is advantageous for these very large machines to spin slowly. These generators are built with a large number of physical pick-up coils. These pick-up coils are arranged as pairs in sets of three. Logically – not physically – the machine appears as shown in this diagram. These sets of pick-up coils are placed around the perimeter of the circle of the rotating magnet, at geometric intervals of 120° around the 360° circle. Single-phase AC is the type of electric service found in virtually all single family residential applications because it is easily derived from three-phase distribution systems, in two ways. The first is to connect a load between any one of the phases of a three-phase service and a suitable electrical return point, usually the common of a 3-phase wye configuration. This is how residential neighborhoods are serviced. 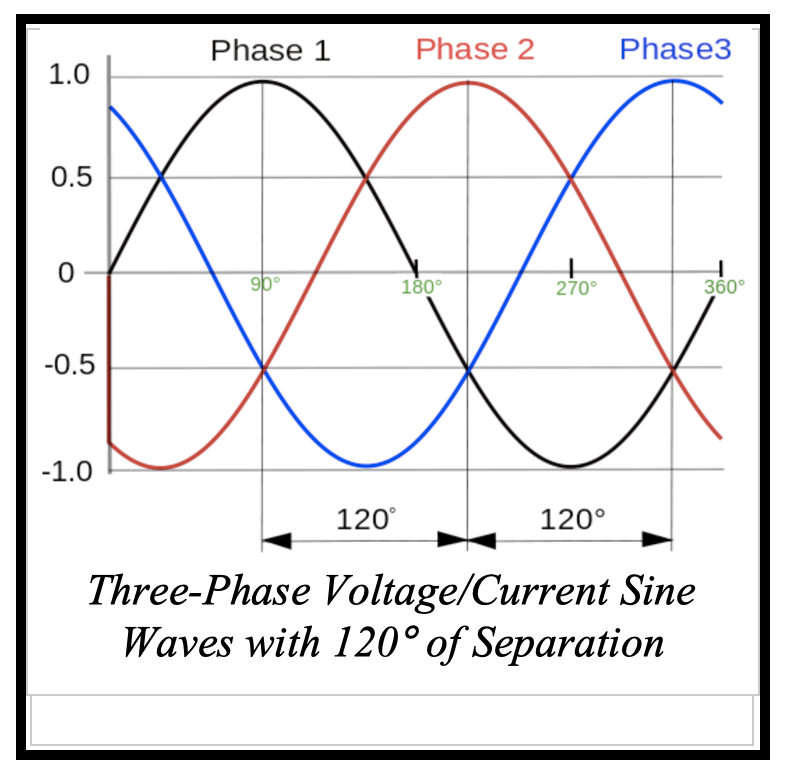 The second way to obtain single phase AC is to connect the load between any two phases of the 3-phase distribution system. This is common in commercial applications and in apartment and condo buildings, but not in single family residential services. Utility company power transformers have input sides, called the “primary,” and output sides, called the “secondary.” Physically, both the primary and the secondary coils of the transformer are independent windings of wire wound around an internal metal core. The windings are electrically isolated from each other; i.e., “insulated” from each other, but are “coupled” to each other by a shared magnetic field. As the incoming primary voltage rises and falls, the magnetic field in the metal core strengthens and weakens. As that magnetic field strengthens and weakens, voltage appears at the secondary. The “load” for the transformer outside your house usually consists of four or so residential homes. Throughout North and Central America the transformer is matched to the primary voltage to produce 120V/240V at the secondary. The utility company transformer reduces the primary voltage to the residential requirement. The range of transmission system primary voltages in a three-phase grounded wye configuration include; 34,500/19,900 volts; 22,900/13,200 volts; 13,200/7,620 volts; 12,470/7,200 volts; and, 4,160/2,400. The first number in these number pairs represents the phase-to-phase voltage; the second number represents the phase to neutral voltage. A single phase primary in a residential neighborhood is most commonly 7,200 volts, measured phase-to-neutral. In rural residential primaries, 13,200 volts is common. Transformer coils can be built with one or more “taps” on both the primary and secondary windings (coils). The secondary winding of a residential power transformer is built with a single tap at the electrical midpoint of the coil. This configuration is called a “center-tap.” The three wires that come to a single-family residential home from the utility pole are the two end-points of the secondary coil and the center-tap. That center-tap conductor becomes the “neutral” within the building’s distribution wiring. In the world of the electrical craftsman (electrician), it is desirable practice in a residential building or boat to have about ½ of the total household load attached to each side of the service transformer. This practice balances the load on the secondary windings of the transformer on the street, and balances the concentration of heat that builds up within the windings and metal core of the transformer. Transformers are oil cooled, and under heavy loads, they can get very hot. Thus, balancing heat dissipation is crucially important in periods of very high electrical demand. Days that are 104°F on the Chesapeake Bay or -30°F at International Falls are not times you’d want the transformer that serves your home to fail! From time-to-time, professional electricians and DIY lay technicians incorrectly refer to the residential “single phase, center tapped, three-wire” configuration as consisting of two phases. The “evidence” is that one leg, “L1,” is 180° out-of-phase with the other leg, “L2.” While “true,” this misleading factoid is a measurement curiosity caused by performing the electrical measurement from an inappropriate reference point. Voltages from the two halves of our residential service will appear to be out-of-phase if measured with an oscilloscope from Neutral to “L1” and then from Neutral to “L2.” The false appearance is the result of looking at the secondary of the transformer with reference to its center tap rather than across the entire winding. This measurement curiosity is not present if the secondary is measured from “L1” to “L2” (or vice versa). Think of it this way. There is only one magnetic field alternately rising and falling in the transformer, driven by the rise and fall of the single-phase input at the primary. That is the defining characteristic of “single-phase” equipment. In a three phase device, there are three independent magnetic fields rising and falling within the equipment. That is the defining characteristic of 3-phase equipment. This distinction becomes extremely important when describing rotational torque in a 3-phase motor. The above discussion is somewhat of a “technicality” issue, which has no practical importance in real life, and can safely be ignored! When I was a pup, and first worked for an electrician in the early 1960s, I learned to refer to the two residential “hot” lines as “legs” instead of “phases.” Doing so distinguishes the in-residence wiring from the conductors of the utility distribution system. Frankly, except for the concepts involved, it’s really not important how you refer to this as long as you don’t let it confuse you! So now we understand that the electrical service entering a single family residence is a “single-phase, center tap, three-wire” service. In our single family residence, if there are overhead wires and utility poles in the street, the three wires coming from the transformer are routed to a weather head or anchorage on the home, where they are spliced to wires leading to the electric meter. In most jurisdictions in the US, the wires coming from the street are owned by the utility company. 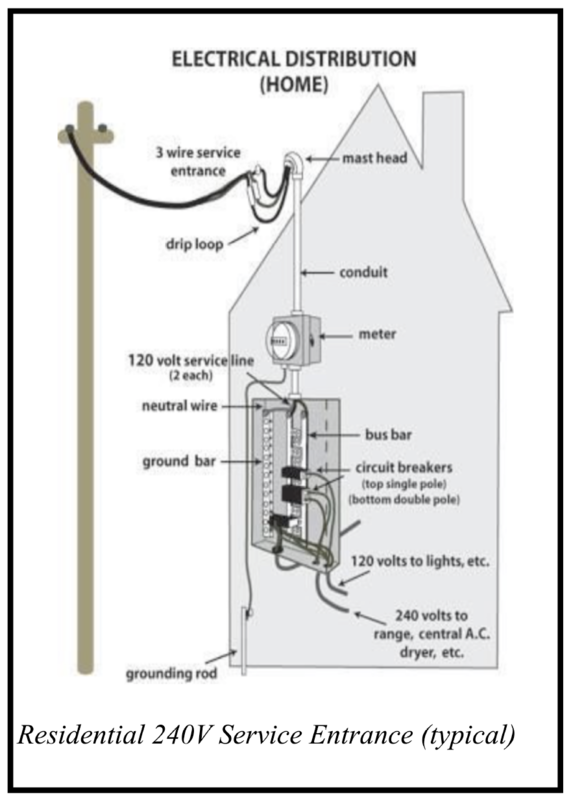 The weather head, meter box and the wires from the “street splice” to the meter box are customer-owned. The meter itself is owned by the utility company. The customer-owned wire to the electric meter and from the meter to the main disconnect panel inside the building is comprised of two insulated wires (usually black) surrounded by a wrapping of bare wire strands. This entire cable assembly is insulated as a single triplex unit. This cable has a flat rectangular cross-section and is known as “Type SE,” or “Service Entrance” cable. The two hot lines are routed to the input side of the “main” circuit breaker in the main disconnect panel. The uninsulated neutral wire of the Service Entrance cable is routed to the neutral buss bar in the main panel. The neutral buss bar is insulated from everything else in the service disconnect box, including the metal of the box enclosure, itself. If the residence has an underground service, wires from a transformer located on a ground-level concrete pad will all be individually insulated wires rather than a triplex assembly. They will be routed through underground conduit into the electric meter and then to the service disconnect panel. The output side of the main circuit breaker in the disconnect panel is attached directly to metal “buss bars,” to which individual branch circuit breakers are fitted. These buss bars are referred to as “L1” and “L2,” because they are on the overload-protected load side of the panel’s main circuit breaker. The input side of the main disconnect breaker is referred to as the “Line” side and the output side is referred to as the “Load” side. What we have not yet discussed is the “safety ground” that is required throughout the residence by the National Electric Code. This safety ground attaches to every outlet, switch plate, ceiling fan, luminary fixture and appliance in the residence. In a residential application, there are one or more copper rods driven into the ground outside the building. The grounding wire is usually of bare #6 or #4 AWG stranded copper wire, and is routed from the buried ground rod(s) to a buss bar located in the service disconnect panel. That buss bar is physically mounted on, and electrically connected to, the service disconnect panel’s metal box enclosure. All of the ground wires that come from outlets and appliances everywhere in the building will be routed to this buss bar. We know from earlier discussion that the “neutral” in the building is a free-floating return line for power that arrives from the transformer hot lines. 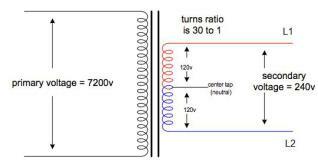 But a free-floating return point is unlikely to be at “zero” volts, which is required to avoid electric shock in the home. The NEC requires that the neutral line in a residence be bonded to earth ground “at the derived source of the electricity.” For a home, the “derived source” is defined to be the main service disconnect panel. In one design of main service disconnect panel, there is a buss bar dedicated to collecting branch circuit neutral conductors and a physically separate buss bar dedicated to collecting safety ground conductors. In this style panel, there is a screw – usually dyed green in color – in the neutral buss bar. That screw is the “system bonding jumper,” or “bonding screw.” This design allows the panel to be used either as a main disconnect panel or as a sub-panel. If the disconnect panel is to be used as the Main Disconnect Panel, the bonding screw must be seated into the panel’s metal enclosure housing to electrically “bond” the “neutral” buss bar to the “safety ground” buss bar. That screw is not for any mechanical purpose; it is the electrical bridge that make the “neutral” to “earth ground” connection. THIS IS A CRITICALLY IMPORTANT SAFETY FEATURE. NEVER OMIT OR REMOVE THE BONDING SCREW! reduce the cost of the installation. The NEC does not limit the number of sub-panels that may be installed in a residential electrical system. Larger residential systems may have sub-panels located in several places around the home; ex: attached or detached garage, detached “guest quarters,” workshop, greenhouse or yard shed, pool house, Man Cave, She Shed, attic-space mechanical service (air conditioning compressor or attic vent fans), etc. 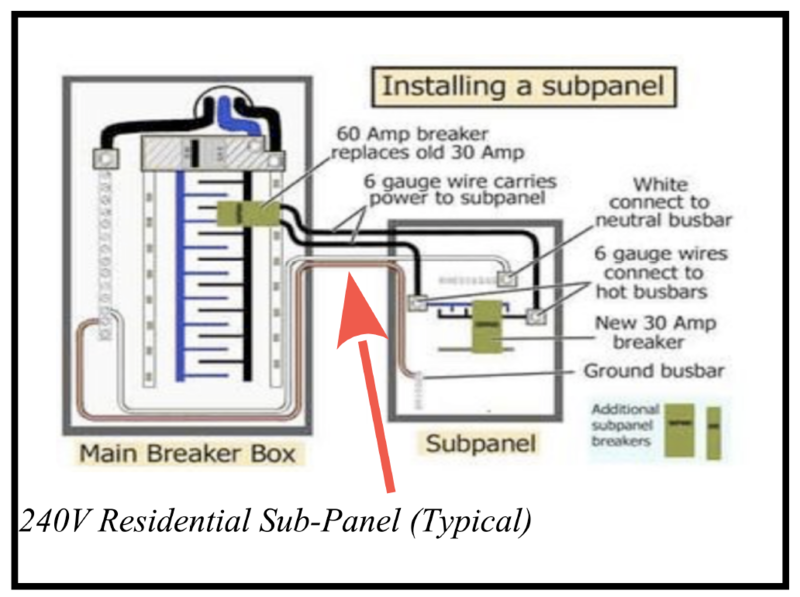 To install a sub-panel in residential applications, a single, appropriately sized 4-conductor cable, “Type SER,” is run from the main service entrance panel to the sub-panel (red arrow, below). This 4-wire configuration carries “L1,” “L2,” “N” and “G” to the sub-panel switch box. Because the sub-panel is subordinate to the main disconnect panel, the neutral-to-ground bonding screw is NEVER used in any sub-panel switch box. By definition, the sub-panel is not the “source” for these branch circuits. The main disconnect panel remains the “defined source” of the circuit. The configuration of sub-panels in a residence is exactly analogous to the configuration of a boat attached to a marina shore power pedestal. Notice the 240V, 3-pole, 4-wire feeder (red arrow) that connects the residential Main Disconnect Panel to the remote sub-panel. This feeder is exactly analogous to the 240V/50A shore power cord of a boat. The sub-panel “feeder cable” is “Type SER.” It contains three current-carrying conductors and a safety ground. Rather than the flat, rectangular cross-section of “Type SE,” “Type SER” cable features a round cross-section. A boat’s “feeder cable” (shore power cord) is “Type SO” or “Type SOW,” which are very flexible cords. Net: a boat looks like a sub-panel to the marina’s shore power system, and that is why the ABYC electrical standard seems so closely aligned with the requirements of the NEC. Notice also in the drawing that the sub-panel safety ground leads back to the neutral buss in the main panel. The neutral-to-ground bond is made only at the “derived source,” which is the Main Disconnect Panel. Likewise, on a boat connected to shore power, there should never be a neutral-to-ground connection anywhere on the boat. In both cases, the neutral-to-ground connection is made at the “derived source,” which is the main distribution panel in a residence, analogous to the marina shore power system for a boat. Note: This main disconnect panel drawing shows a single buss bar which is shared by the neutrals and the grounds of branch circuits. This arrangement is an NEC-compliant variation in a main disconnect panel. Many main disconnect panels and all sub-panels will have physically separate busses for the neutrals and the grounds. Between legs “L1” and “L2” alone, without “N,” we can power 240VAC, two-wire (two-pole) appliances; for example, the 240V motor of a deep-well pump, 240V baseboard electric heat radiator(s), or a 240V hot water heater. With “L1,” “L2” and “N,” we can power 240V, three-pole appliances; these appliances require 240V for some internal functions and 120V for other internal functions; for example, an electric dryer, range cooktop or oven; all of these appliances require 240V for the heating elements, but 120V for the motor and control circuits. Or, central air conditioning system, which requires 240V for the compressor, but only 120V for the control circuits. Finally, with either “L1” or “L2” alone, and “N,” we can power the entire panoply of 120V, two-pole household loads; oil or gas furnace, dishwasher, incandescent and florescent lighting, computers, printers, routers, wireless telephones, TVs, VCRs, stereo, refrigerator, freezer, microwave oven, coffee maker, toaster, crock pot, waffle iron, blender, mixer, hair dryer, steam iron, battery chargers, shop tools, CPAP, oxygen concentrator, etc; you get the idea! Branch circuits originate at a circuit breaker located in either the main service panel or a subordinate sub-panel. Branch circuits feed either convenience outlets or feed into the attachment enclosure of a permanently installed appliance. For convenience of installation and maintenance, the individual black, red, white and bare wires of a branch circuit are packaged together within a sheath of plastic outer insulation. Most residential wire sold in big box, hardware stores and home centers is “Type NM,” meaning “non-metallic.” This is often called “Romex.” “Type NM” intended to power 120V circuits is called “two-wire with ground,” or “two-pole, three-wire.” “Type NM” intended to power 240V circuits is called “three-wire with ground,” or “three-pole, four wire.” Another common residential wire is “Type AC.” “Type AC” has an armored metallic sheath around the individual colored conductors instead of a plastic outer sheath. “Type AC” is used for furnace controls for LPG and oil burners, hot water heaters and other appliance in an equipment room or basement, as well as when installed in areas exposed to being physically disturbed or damaged, such as workshops or garages. Carefully match the wire you buy to the application you have, based on NEC and local electrical codes. In the U. S., the color of the insulation on individual wires is important; “L1” is black, “L2” is red, “N” is white and “G” is uninsulated copper in convenience and appliance circuits, but can be green or green with a yellow tracer when insulated. Occasionally, you may encounter a wire in a service disconnect panel or a junction box that has a piece of electrical tape of another color conspicuously wound around it near its connecting end. In a residential building, you may see red or black electrical tape wound on a white insulated wire, or you may see a piece or white electrical tape wound on red or black insulated wires. Do not remove these pieces of tape; they are not an accidental left-over! It means the installing electrician has “changed” the meaning of the base color of the insulation of the wire. In residences, the most common place to find it is in wall boxes containing switches that control lighting or fans from multiple doorway locations, or wall boxes at the top and bottom of staircases. If you ever see this, always triple-verify how the wire is actually being used before proceeding or disturbing the connection. I have spent a lot of time talking about the current that arrives at the load in one of the energized conductors, “L1” and/or “L2,” and returns to the source in the neutral, “N.” I have not discussed the use of the green ground wire, “G.” In a correctly wired, normally operating home or boat AC electrical system, the ground wire should never have any current flowing in it. The purpose of the safety ground wire is to provide an emergency path for current in order to trip the supplying circuit breaker to remove power from a faulting circuit. By definition, current flowing in a safety ground is symptomatic of an electrical fault condition. Fault currents originate from the hot line(s), but return to the source in the safety ground instead of the neutral. This condition is also known as a “ground fault.” Never use wire covered with green insulation as a current-carrying conductor. Contrary to popular belief, circuit breakers/fuses do not protect attached loads! Circuit breakers do not protect TVs, entertainment systems, computers, microwaves, coffee pots, pumps or compressors. CIRCUIT BREAKERS/FUSES PROTECT THE POWER-CARRYING WIRING THAT IS HIDDEN IN WALLS AND/OR ENCLOSED IN CHASES, RACEWAYS AND CONDUIT THROUGHOUT YOUR HOME OR BOAT! They protect the WIRING of your home/boat. This is a critically key concept. When wires overheat, their colored insulation can melt, exposing the live conductor. At that point, energized conductors can touch other now uninsulated conductors, and sparks can fly. Wires in closed spaces, unusually warm spaces, or chases/raceways/conduits warm up more than wires in un-congested, cool, spaces where there is plenty of air circulation. Overheating softens the insulation. Wires can get so hot that they will literally melt and can weld themselves together. This process can cause adjacent nearby wood and composite building materials to burst into flame. So, circuit breakers protect wires from overload, and therefore, protect the insulation from overheating, melting, failing and causing fires. There are several common types of circuit breakers, and several manufacturers of circuit breakers and compatible service disconnect panels. Circuit Breakers for 120V circuits are singe-wide; for 240VAC, they are “stacked” or “doublewide.” Doublewide breakers have mechanically linked operating levers, and must be doublewide so that they can be physically installed in a service panel in a way that allows them to mate to both the “L1” and the “L2” buss bars at the same time. If one leg of a 240V circuit – say, “L1” – develops a fault that causes the circuit breaker to trip, the mechanical link causes the other leg – in this example, “L2” – to also be disconnected from it’s source. Never remove the mechanical linkage between doublewide breaker operating levers. Circuit Breakers should be selected based on the size of the wire they protect. A 15A circuit breaker protects #14 AWG, Type NM cable; a 20A breaker protects #12 AWG Type NM, and a 30A breaker protects#10 AWG Type NM. These numbers are based on the 60℃ temperature rating of “Type NM” wire. Wire ampacities are higher with the 105℃ temperature rating of “Type BC5W2” boat cable. Circuit breakers used for “over-current protection” (OCP) have rating of 15A, 20A, 30A or 50A. That said, modern, sophisticated circuit breakers actually carry several ratings. In a true short circuit, an over-current fault can instantaneously be as high as several hundreds of amps. By arcing, that extreme amount of current can weld the contacts closed and permanently damage the circuit breaker’s contact points, rendering the breaker inoperable. Circuit breakers and all switching devices carry an “Ampere Interrupt Capacity” (AIC) rating. AIC is the amount of current the device can interrupt without being damaged by arcing. Modern circuit breakers can also have multiple purposes. Besides OCP, one added purpose is “Ground Fault Protection” (GFP) and another purpose is “Arc Fault Protection” (AFP). GFP breakers contain a circuit that compares the amount of current being delivered in the hot wire(s) to the amount of current returning in the neutral. Any difference in outgoing and returning current is a “ground fault.” Household “Ground Fault Circuit Interrupter” (GFCI) breakers are designed to trip “off” if the difference between supplied and returned current is as little as 4mA – 6mA. “Equipment Leakage Circuit Interrupters” (ELCI) onboard boats – and Equipment Protective Devices (EPD) on dockside pedestals – protect the whole boat, as a sub-panel. ELCI/EPD are designed to trip “off” in less than 100 mS if the difference between supplied and returning current exceeds 30mA. Finally, for use on gasoline powered boats and environments of potentially explosive gas, circuit breakers (and other electrical switching devices) must be rated as “ignition protected.” This means that any internal arcing (sparking) caused by the contacts opening under load must not be able to come into contact with any airspace outside the breaker’s enclosure. If explosive gasses were able to infiltrate the breaker’s enclosure, the vapors would be able to cause an explosion. Of course, common residential circuit breakers are not made to the standard of “ignition protected” devices. In general, in my opinion, it is bad practice to use “big box” and hardware store electrical switchgear equipment, circuit breakers or wire made for residential applications on a boat. Residential switchgear is not made to withstand humid, salt-containing air, is not suited to the materials properties required by ABYC, and is not equivalent in temperature ratings for the ampacities of given conductor sizes. NEVER, NEVER use solid core household wire on boats. “How much electrical “stuff” can we run “all at once” in our single family residential home?” This is a key question for both residential applications and boats. For boaters, it relates directly to discussions about 30A and 50A shore power cords and inlet wiring sizes. So to the question, “what does it mean to have a 200A or 400A electrical service?” A “200 amp service” means that the installed utility-owned drop from the street, the conductors of the ”Type SE,” 3-wire service entrance cable to the electric meter housing, the conductors from the electric meter to the service disconnect panel, the service disconnect panel itself, and the earth ground connection are all sized and designed to operate in a safe manner when handling up to 200 amps for a 200A service, or up to 400A for a 400A service. If you exceed that capacity, that set of essentially unprotected electrical components may fail. In effect, 200A/400A is the “ampacity” of the unfused and unprotected service entrance feed components. So even though you have 500 to 800 amps of branch circuit load attachments, if you never exceed a combined aggregate load of 200 total amps, the distribution box will serve you just fine. If every you do blow the main 200A/400A breaker in the home, have the cause determined by a qualified electrical professional! The previous analysis of loading a residence main disconnect panel applies in exactly the same way to boats. Most cruising-sized boats with 30A shore power will have well in excess of 30A of branch circuit capacity; likewise, boats with 50A shore power will have proportionally more branch circuit capacity. That power is delivered onto the boat through a (30A)(50A) onboard main disconnect breaker, or compatible ELCI. As with the residence case, the service distribution panel is not expected to run all of the branch circuits at the same time, nor is it expected that branch circuits will actually run at their maximum breaker capacities. If you exceed the maximum main breaker capacity, you blow either the main disconnect breaker, or the Shore Power pedestal breaker, generally without blowing any of the individual branch circuit breakers. The ABYC requires an AC Main Disconnect Circuit Breaker within 10 feet of the shore power inlet. Nothing is allowed to be connected ahead of that main disconnect breaker except the actual shore power inlet connector. Recall, the purpose of circuit breakers is to protect wiring, and in particular, wiring hidden from view, and away from reasonably easy access, and running through spaces containing combustable materials. The AC Main Disconnect Breaker protects the boat’s main inlet wiring (the boat’s “service entrance cable,” if you will) up to the main distribution panel that serves the boat’s individual branch circuits. Remember, the ampere rating of the disconnect breaker must be matched to the ampacity of the wiring between the power inlet plug and the main disconnect panel on the boat. In the case of boats, the wiring installed by the boat manufacturer should reflect what the naval architect sped’ed for the boat. Remember, the wires we’re talking about provide power to the AC circuit breaker panel of the boat, and carry the total aggregate current load for the whole boat. Sizing shore power cords smaller than necessary could be dangerous. Since 2008, the NEC has constantly extended the AFCI requirement to now include all habitable areas of a home, including kitchens, family rooms, dining rooms, living rooms, parlors, libraries, dens, bedrooms, sunrooms, recreation rooms, closets, hallways, laundry areas, and similar places. Some states have modified these requirements when adopting the NEC as statewide regulatory code (building codes of all kinds are done on a County-by-County basis in Maryland). Check local building codes before proceeding. Since 1971, the NEC has continually expanded the coverage requirements for GFCI protection. Today, GFCI protection is required in all “wet” locations in residential buildings, which includes bathrooms, outdoors locations, rooftops, crawl spaces, unfinished basements, kitchen countertop areas, sinks, laundry areas, bathtub/shower stall areas, boathouses, locker rooms, pool areas: you get the idea. On boats, the ABYC requires GFCI-protected outlets in heads, galley, machinery spaces and everywhere on the weatherdeck. Should you wish to retrofit AFCI and GFCI-compliance into an older home (a good idea), a reasonable approach is to replace the conventional circuit breakers in the main disconnect panel or sub-panel that serves affected branch circuits with combination AFCI/GFCI-protective circuit breakers. That way, all outlets served by that circuit breaker are AFCI-protected and GFCI-protected. Combination breakers are available from many manufacturers for about $35 – $45 apiece (as of January, 2018). Discounts are available for volume purchases. On the boat, physically compatible GFCI-breakers are not generally available, so GFCI-protected outlets are recommended. GFCI-protected devices do present some unintended consequences. A common scenario is for boaters to use adapters to enable a 30A or 50A shore power cord to use a standard 15A or 20A, 120V GFCI-protected utility outlet on a dock. This provides power for a fridge, a battery charger, and maybe a reading lamp, for a night or two. In the case of deteriorated, cracked insulation on a shore power cord lying in the water, a ground fault current could easily be large enough to trip a GFCI breaker, and that fault would not go away over time. That condition is a true ground fault. Not all trips are caused by true faults. Sometimes, electronic components (capacitors and inductors) within the familiar portable computer “power bricks” can cause “momentary” surge currents that can trip sensitive GFCI protection devices. Insulation breakdown on blower motors, pumps and air conditioning compressors, as well as aging hot water heater elements, can cause transient power leaks. Power spikes on power lines can trip GFCI devices. All GFCI implementations are exposed to false faults resulting in “nuisance” trips. When attaching to GFCI-protected outlets, it’s a good idea to set all AC breakers “off” first, then plug in, then turn branch circuits “on” one at a time. For marinas and boatyards, starting in 2011, the NEC has required ground fault protection on new construction docks (except residential, single family docks until 2017). These devices are called Equipment Protective Devices (EPD), and are also subject to “nuisance trips.” To reduce the incidence of nuisance trips, the NEC has adopted two accommodations to lessen the occurrence of false trips on docks. First, the size of the leakage current – 30mA – that would cause a marine pedestal EPD to trip “off” is greater than (less sensitive than) a 15A/20A GFCI convenience outlet. Second, the length of time (duration of) the leakage current needs to be present – up to 100mS – has been made longer. Since 2011, the rollout of these EPD sensors at marinas has been slow, but they are beginning to appear in greater numbers, and all boaters should expect to see EPD protection of marine outlets on docks with increasing frequency over the next few years. The electrical knowledge and skills found among dock staff are unlikely to resolve problems for those who do experience nuisance trips at a marina. Particularly on holidays, weekends and off-hours, high-school and college summer help are not likely to be able to assist transient boaters. “Nuisance trips” may or may not mean you have wiring errors or equipment faults on your boat, but the fact is, many boats do have wiring errors and equipment faults that until recently have been silent and non-symptomatic. Obviously, “troubleshooting” this scenario could be very complicated and time consuming. If you have the skills to do it yourself, it’ll cost lots of time. If you hire a marine electrician to do it for you, it’ll cost lots of money. Either way, it won’t be easy or inexpensive. It may well be that you just have older switchgear equipment, like a reverse polarity light with a filament that provides a “leakage path” from “neutral” to “safety ground.” This is not an unsafe condition, but it will trip some EPD devices. What is nasty about this is that “your boat is at fault,” and that’s precisely what you’ll get from the marina operator. There are two types of three-phase wiring configurations: “wye” (or “star”) and “delta.” Three-phase distribution systems are used in commercial facilities and larger industrial facilities. Within this category, I include condos, townhouses, strip mall offices, shopping centers, marinas and boatyards. So, consider for example the case of three-phase distribution systems feeding end-user attachments in a condo or apartment. In our “single family suburban residence” model, we learned the US standard voltages of a “single phase, center tapped, three wire” service entrance would be 240VAC/120VAC. For many technical and economic reasons, light commercial and multi-family residential buildings are supplied from a three-phase, wye-connected service. In a wye configuration, a 4-pole, 4-wire distribution system comprised of “ϕ-1,” “ϕ-2,” “ϕ-3” and “N” is delivered into the building. What is finally delivered, in turn, to the individual occupancy units is a 3-pole, 3-wire feeder analogous to the single phase street feed. 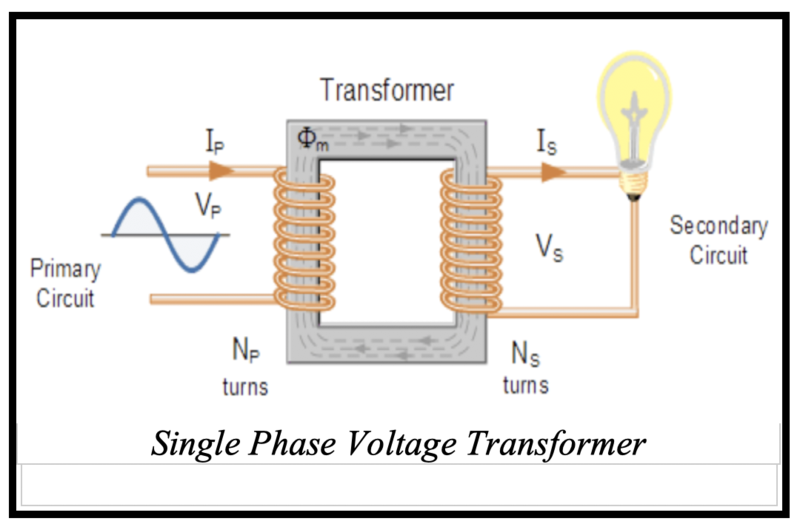 It is not, however, derived from the secondary of a single phase transformer. Rather, it consists of any two of the three phases that came into the building, together with wye’s “N.” As an example, suite 100 may receive “ϕ-1,” “ϕ-3” and “N,” and suite 102 may receive “ϕ-2,” “ϕ-3” and “N,” and so forth. In the wye configuration, the voltages delivered to individual occupancy suites are not the standard 240VAC/120VAC. Between “N” and any of the phases, the suite would see 120VAC. But between the two phases, the suite would see only 208VAC. This service is written on paper as “208V/120V Y,” to indicate the phase-to-phase voltage, “208V,” the phase-to-neutral voltage, “120V,” and the fact that the configuration is a wye connection, “Y.” This practice is common enough in the US that household appliances built for 208VAC/120VAC are commonly available in retail outlets for condo and townhouse dwellers. The most significant impact might be to 240VAC pump and compressor motors. With a low voltage on the appliance, efficiency will be compromised, and motor overheating might occur. Three phase “Y” distribution configurations are common in marina’s. Boats with one or two, 2-pole, 30A shore power connections would not be affected. Those connections are 120VAC. Those with two 30A shore power cords connected to a “Y” adapter into a 50A outlet on a pedestal are also unaffected. That’s because even though you are bringing the two different phase lines aboard, your boat does not have any 208V/240V appliances, so nothing aboard is affected. Boats that connect to shore power with 3-pole, 50A shore power cord are potentially affected, as that 3-pole, 4-wire connector provides 240VAC with the expectation that it will be used on the boat. Without 240V appliances, there is no affect. The only thing you, as a boat owner/operator, can do to protect your appliances is to measure, with your onboard volt meter(s), the line voltages (2xxVAC/120VAC) provided by the shore power pedestal, each and every time you hook up. In this way, you will know what the marina is delivering. I recommend you become meticulous about this. If you are not receiving 240VAC – if you are receiving only 208VAC – you will have to make decisions about what to do next. Do not expect the dock hands that help you tie up to know what they have. Some may, but I would assume many would not. Frankly, even the marina manager may not know. This entry was posted in AC Electricity Fundamentals - 1, Boat AC Topics on 2019/02/14 by gilwellbear.